At the grave side of her husband during the service she notices a stranger watching her. She asks her brother in-law about the man staring at her, one she feels compelled to talk to. Her brother in-law Dan tells her to stay away from the stranger that he looks dangerous. But Anna is drawn to the man and before leaving she just can not stop herself from going over to him. The stranger has something to tell her, but Dan comes to her side and makes her leave before the stranger can deliver his message. Things get crazy for Anna right after the encounter with the stranger. She is being stalked by a killer and the stranger turns up at her house and then again at her husbands office when she goes to clean out his office. The Stranger (Eli) convinces Anna to trust him that he knows what happened to her husband and will tell her if she will accompany him to a safer place. She agrees and she is taken to a secret compound and told about her true ancestry and what really happened to her husband. It seems Anna is a Nephilim and part of an old prophecy. Things heat up between Anna and Eli pretty quickly. I can not go into too much more about the book without giving everything away. If you like paranormal then this is a good read. I would not recommend for younger reads due to some sexual content seventeen and older I think. 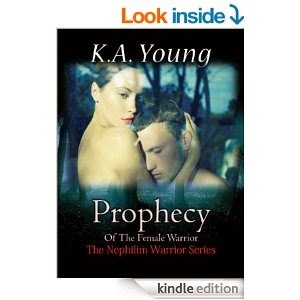 this book is part of the Nephilim Warrior Series. I am reviewing the Kindle version. At the moment it is a free book so check it out. Next up another quick read and again paranormal. "Witchwood Estate- Going Home" Written by Patti Roberts. I am friends with Patti on FaceBook. Now this one I really liked. Alexandria Santorini learns as a child that she comes from a long line of Harvey witches. She has never really had any friends, but she doesn't mind, after all she has Olly and Martha Barnby. She was taken in twelve years ago by the Barnabys after her parents died. Now that Alexandria is almost an adult it is time for her to leave her loving guardians and return to Ferntree Falls and Witchwood Estate her legacy. She hopes on the bus after a long sad farewell and heads to Ferntree Falls. While on the bus she meets a strange boy who isn't really a boy but kind of a ghost but not a ghost. It turns out he was cursed by a witch and he is now looking for his love who has vanished. Things on the bus ride get crazy and Alexandria nearly loses her life. There is an evil witch on the bus and she wants something from Alexandria. The story is very short only 49 pages, but is an excellent introduction to the series. This one is fine for younger reads as well as older ones. Again it is a paranormal book so if you like that kind of book it will be perfect for you. It is also free for Kindle at the moment.